Open for more than 20 years, Keystone Fireworks’ huge Pennsylvania Superstores are accessible from New York, New Jersey, Maryland, Virginia, West Virginia, Washington, DC and all surrounding areas. 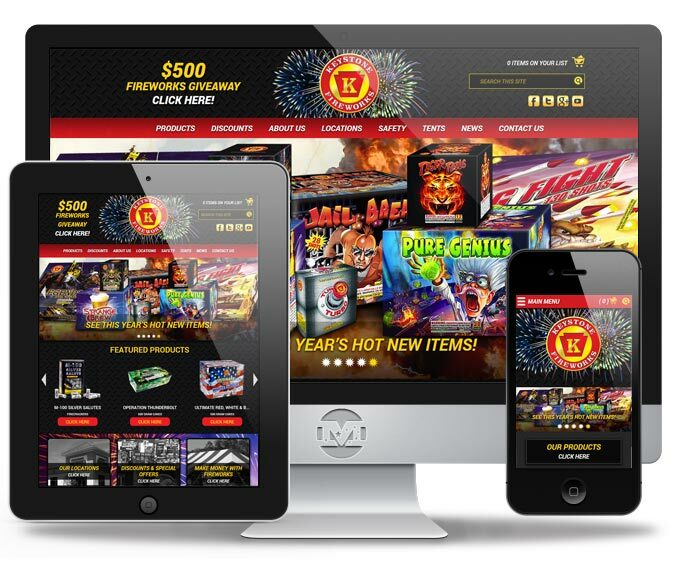 They are Pennsylvania’s premier seller of consumer fireworks and sell their own full line of signature Keystone Fireworks items. MIND worked with owner, Kevin Shaub, to revamp the overall look and user interface of the site. MIND made significant changes to the appearance and functionality of the site, including upgraded product display, location pages, and custom coupon creation. Imagery was refined and made consistent while content and colors were revised to be more visually appealing to the fireworks enthusiast. DO IT RIGHT THE FIRST TIME! CALL MIND! This site is constructed from 100% recyclable materials.